Parker Dam spans the Colorado River between Arizona and California, 155 miles downstream from Hoover Dam. Built between 1934 and 1938 by the Bureau of Reclamation, Parker Dam is operated with Hoover and Davis Dams to bring water and power benefits to residents of the lower Colorado River Basin. Parker Dam's primary purpose is to provide reservoir storage for water to be pumped into the Colorado River and Central Arizona Project Aqueducts. 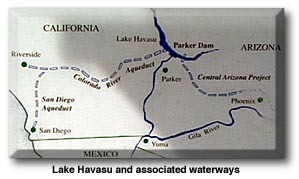 Lake Havasu, the reservoir behind Parker Dam, is about 45 miles long and can store nearly 211 billion gallons of water. Lake Havasu provides clear, desilted water for the Colorado River Aqueduct and serves the Central Arizona Project. 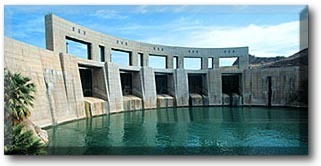 Parker Dam was constructed with funds advanced by the Metropolitan Water District of Southern California. Since 1941, the Colorado River Aqueduct has delivered water from Lake Havasu behind Parker Dam to the Los Angeles metropolitan area. The Colorado River Aqueduct is also tapped by the San Diego Aqueduct, which takes water to that city's water system as well. Parker Dam is the deepest dam in the world; 73 percent of its structural height of 320 feet is below the original riverbed. Two-hundred and thirty-five feet of the Colorado riverbed was excavated before concrete was placed for the dam's foundation. Only about 85 feet of the dam is visible; the dam's superstructure rises another 62 feet above the roadway across the top of the dam. Parker, Davis and Hoover Dams and their power plants are operated and managed by the U.S. Bureau of Reclamation from the Lower Colorado Dams Facilities Office at Hoover Dam. The Department of Energy, through the Western Area Power Administration, markets the hydropower produced by these three power plants to cities, agricultural users and Native American communities throughout the Southwest. Parker power plant, located on the California side of the Colorado River immediately below the dam, houses four hydroelectric generating units. Each unit can produce 30,000 kilowatts of non-polluting hydroelectric power. Four 22-foot-diameter pipes called penstocks can each carry up to 5500 cubic feet of water per second (over 41,000 gallons) to feed the generating units. About 50 percent of the plant's power output is reserved by the Metropolitan Water District of Southern California (MWD) for pumping water through the Colorado River Aqueduct to the Pacific Coast. The remaining power is marketed by the Western Area Power Administration. Under an agreement between Reclamation and MWD, the latter agency paid essentially the entire cost of constructing Parker Dam. MWD's Whitsett Pumping Plant, 2 miles upstream from the dam on Lake Havasu, lifts water from the reservoir into the Colorado River Aqueduct. The MWD was organized in 1928 to plan, finance, build and operate a water-supply system from the Colorado River to California cities and other locations within its service area. In September 1931, MWD voters authorized a $220 million bond issue to finance construction of the Colorado River Aqueduct. Construction of the Aqueduct began in 1932. Reclamation, using funds advanced by MWD, began constructing Parker Dam two years later. 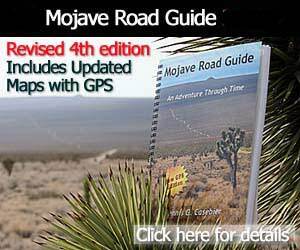 But it wasn't until June 17, 1941, that the Aqueduct began delivering water from Lake Havasu to the Pacific Coast. By 1961, to keep pace with increasing water needs, MWD had expanded the Aqueduct to reach its full delivery capacity of 1,212,000 acre-feet of water annually, or more than 1 billion gallons a day. Constructed by the Bureau of Reclamation between 1973 and 1992, the Central Arizona Project can deliver approximately 1.5 million acre-feet (488 billion gallons) of Colorado River water each year for cities, industries, Indian communities and agricultural areas in central and southern Arizona. The project also provides flood control, power, recreation, and fish and wildlife benefits. Colorado River water is delivered to users by pumping it from Lake Havasu into the conveyance system, then relifting it through a series of pumping plants across the state. From Lake Havasu to the end of the aqueduct, the water will be lifted nearly 2,900 feet in elevation. Havasu, the project's largest pumping plant, lifts the water from Lake Havasu to the Buckskin Mountains Tunnel inlet 824 feet above the lake's surface. The water then flows seven miles through the tunnel to the first section of canal. Parker, Davis and Hoover Dams are interconnected through the Western Area Power Administration transmission system which serves nearly 70 municipalities, cooperatives, federal and state agencies, irrigation districts and investor owned utilities in Nevada, California and Arizona. The system also includes transmission facilities of the Colorado River Storage Project -- a system of six major dams, including Glen Canyon Power plant, and several smaller water development projects that provide multipurpose benefits in the upper Colorado River Basin. The total system consists of more than 2800 miles of transmission lines serving 40 power substations managed by a Central System Dispatching Office in Phoenix, Arizona. The installed generating capacity of Colorado River projects managed by Western is about 3000 megawatts -- enough energy to provide electric service for a year to more than two million homes. More than 9.5 billion kilowatt-hours of Colorado River hydroelectric energy is marketed each year, resulting in annual revenues to the U.S. Treasury of more than $140 million. In addition to its water storage and power producing capabilities, Parker Dam also performs other functions. It provides flood control by capturing and delaying flash floods discharged into the river from tributaries below Davis Dam. It reregulates water releases from Hoover and Davis power plants, smoothing the Colorado's flow for the benefit of downstream water users. Self-Guided Tour Canceled as of June 1997. Public Camping: Two public campgrounds are located on the Parker Strip providing campsites along the Colorado River. Sites are available on a first-come-first-serve basis; there is a 14-day stay limit at each campground. Boat-in Camping: There are 125 lake shore campsites available along the Arizona side of Lake Havasu, from Lake Havasu City to Parker Dam. Most sites have a picnic table, shade, BBQ grill, pit toilet and trash can and are available on a firstcome-first-serve basis. The fees for these sites are $3.00 per site, plus $2.00 per watercraft, plus $5.00 for overnight use. Glen Canyon Dam - Lake Powell Video Held behind the Bureau of Reclamation's Glen Canyon Dam, waters of the Colorado River and tributaries are backed up almost 186 miles, forming Lake Powell. The dam was completed in 1963. Take a look at this tremendous feat of engineering - the Glen Canyon Dam. Lake Mead Video - Houseboating & Viewing Hoover Dam DesertUSA rented a houseboat to explore the western part of Lake Mead. Our first stop was the Hoover Dam off the Boulder Basin. Without Hoover Dam, Lake Mead wouldn't exist today. Come along with DesertUSA staff as they explore Lake Mead and check out Hoover Dam. Take a look at the cove where we camped, and the Bighorn Sheep encounter we had there! Lees Ferry Video Due to the shale deposits which slope gently to the river here, Lees Ferry was the only place to cross the Colorado River for 260 miles until the Navajo Bridge was built across Marble Canyon in 1927. Join DesertUSA as we explore this historic site.